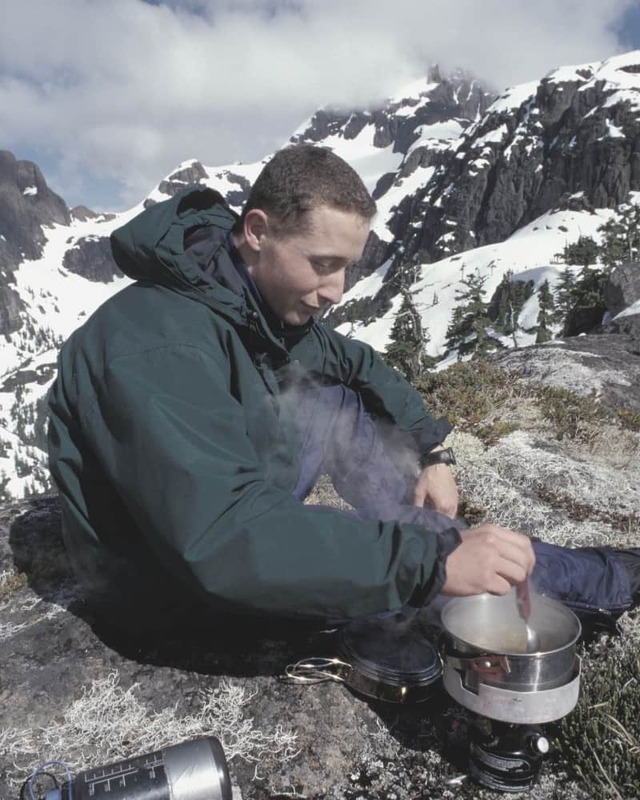 Backpacking food has changed a lot since the days when Scouts bought chili and beef stew for their 50 milers and cooked dinner by setting the cans in the fire. Just in the past decade, a large number of suppliers have introduced a variety of tasty, nutritious dehydrated meals that eliminate a lot of the shopping and food-repacking that used to be part of a long-term backpacking adventure. 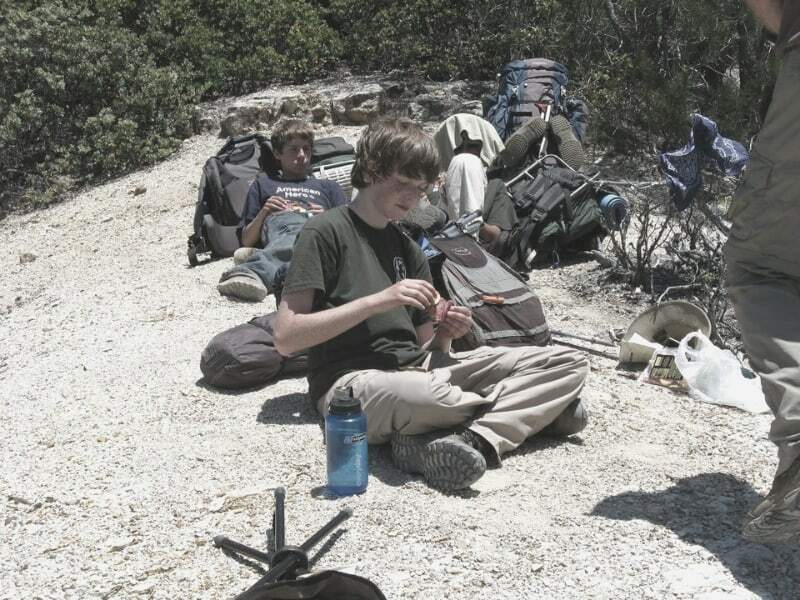 Many backpacking classes teach that an individual requires 2,000 to 3,000 calories per day. To put this in perspective, a typical one cup serving of a dehydrated backpacking meal provides about 300 calories. Therefore, you would need about ten servings in a day to provide your energy requirements. That is a lot of food – so make adjustments according to the needs and appetites of your group. It is critical that a Scout properly fuel his body to maintain energy. Is all this talk of trailside food making you ravenous for more information? Unsure about which backpacking mess kit to purchase for your next trip? We give you the skinny on which features to look out for and give our recommendations. Our review of the best backpacking stoves gives you all the information you need to make an informed decision on your next gear purchase. Sometimes Scouts do not want to eat because they are tired or because they think they are not hungry. The trek leader should be watching to make sure that everyone is consuming enough calories to keep them going. Plan to minimize clean-up. Mix all the ingredients for individual meals (or for two people) in zip lock bags. Add spices for extra taste. (Repackage dehydrated meals into zip lock bags as well.) When its time to eat, add hot water and let the bag sit in a “cozy” for 20-30 minutes to “cook” while setting up camp. Don’t buy everything at Costco. The tastiest backpacking food is at ethnic food stores. Energy Bars and snacks from health food stores are often high in calories. When hiking in large groups, pack all the food for each meal into a stuff sack with a number on the outside. Make a list of the bag numbers and the meals inside so you can find the proper stuff sack quickly. Gatorade is just one brand for electrolyte replacement. There are other types (Vitalyte, etc.) with more restorative power. Ask at your gym or health food store. For breakfast, put your oatmeal packets into a cup and pour the boiling water directly into the packets to eliminate clean up. Carry and eat the following “Super Foods” whenever possible (Backpacking Super Foods according to Pack It Gourmet) – Salmon, Berries, Olive Oil, Walnuts, Almonds, Dark Chocolate, Full Cream Powdered Milk, Dehydrated Spinach, Tomato Products, Oats, Red Beans, Kidney Beans, Flaxseed. Learn how to dehydrate your own food and you will save money in the long run. Serious backpackers have food dehydrators (or have friends with dehydrators). They spend hours measuring, drying and packaging their meals. Start rehydrating dinner during the mid-afternoon rest stop and when you get to camp your dinner will be ready a lot faster. Scout Leaders (and some Scouts) can get very cranky in the morning if they don’t have their cup of coffee. Here are some suggestions on how to brew the best trail cup possible. A Scout’s diet for backpacking should be nutritionally balanced with about 50% carbohydrates, 25% protein, and 25% fats. Carbohydrates are almost pure energy. They come from foods like grains, fruits, nuts, and candy. The sugar in candy provides a very quick burst of energy but is short lived. Grains, such as oatmeal or other cereals are longer lasting. Experienced outdoorsmen eat their lunch “from breakfast to dinner” to ensure a continuous supply of ready energy. Protein is somewhat difficult to digest and does not provide “instant” energy. Proteins are found in meats and dairy products, and also in nuts. Proteins are necessary for bodybuilding and repair and should be consumed in small amounts during the day then concentrated in the evening meal. Beef Jerky, canned meats, cheese, and gorp are common Scout sources of protein. Fats produce energy that is consumed by the body over a comparatively long period. Because the digestion of fats is not easy, foods with fats should be spaced in small quantities throughout the day to prevent overloading the digestive system during periods of high exertion. The largest quantity of fats should be at dinner, with smaller quantities for breakfast. Fat has over twice the energy of proteins or carbohydrates. A small amount of high-fat foods, like nuts, eaten at bedtime will keep your body “stoked” with energy during a cold night. Nuts also contain protein that will aid muscle repair. Fluids are really important. Dehydration among backpackers is common and leads to all kinds of problems. During heavy exertion, you should try and drink about one liter of water every hour or so. Always remember . . . “clear and copious.” Soft drinks have no place on the trail, except Diet A&W root beer floats after the hike. As an alternative to boiling all your water consider taking a portable water purification system. Here some of my favorite backpacking foods plus a few things that have been suggested by friends. Dinosaur Egg Oatmeal, Cream of Wheat, Granola with powdered milk, dry cereal with powdered milk, Dried Fruit, Oatmeal Cookies, Fig Newtons, and Candy. (Oatmeal is gross but I can eat it with nuts, raisins, brown sugar, or other things to mask the taste.) Look for full fat powdered milk at specialty food stores. If you can’t find full fat powdered milk, you can improve the taste of non-fat powdered milk by mixing in some dairy creamer. Breakfast for most Americans is about carbohydrate replenishment. So focus on carbs when choosing your menu. Also, You do not have to eat a big breakfast all at once. Spread it out. Have something with tea when you get up. Then another snack when you are packing up. Then hike and snack all morning. Caffeine: Starbucks Via, Vinacafe , Folgers Instant Coffee, or strong Tea. (Tip: mix instant coffee and creamer in one container before you leave home.) Apple Cider and Hot Chocolate are popular with Scouts. Freeze Dried or Dehydrated meals (check out our freeze dried food reviews), instant soups (chicken noodle, cream of chicken, vegetable, onion, potato), tortellini, fettuccine, red beans & rice, rice pilaf, macaroni & cheese. Add salami, packaged tuna/salmon or packaged chicken for protein. Ramen with a couple of tablespoons of peanut butter is fast and nutritious. Staples: Jerky (beef or turkey), nuts, peanuts, dehydrated hummus, dry salami, summer sausage, peanut butter, canned chicken, canned spam, canned deviled ham, packaged tuna/salmon, and packaged chicken. GORP: stick with good old raisins and peanuts or add any of the following: M&Ms, dried mango, almonds, cashews, dried apricot, sesame sticks, peanut M&Ms, almond M&Ms, dried pineapple, or high-fiber cereals. Energy Bars: the best energy bars have good caloric density and nutrition, however, if they taste good, they are usually expensive. The best ones are in health food stores. Cheese: doesn’t keep as well as some other foods but is high in calories. Cheddar cheese lasts a couple of days. Parmesan cheese lasts a week and is a great topper for most dinners. String cheese tastes great, even after a few days. Crackers / Dense Bread: my favorite is Ritz crackers because they are good with cheese, salami, tuna, and peanut butter. The downside is that you often have to eat crumbs instead of crackers unless you are a careful packer or have them in a bear canister. Bagels and Flour Tortillas last a few days and are very filling, but are usually dry. Dried Fruit: good for fiber, variety, and vitamins. Use them with some discretion since they are only around 80 calories per ounce and they cause gastric problems for some people. Fruit leather (cherry, strawberry, grape, apricot) tastes better than dried fruit. Candy: Chocolate, Jolly Ranchers, Altoids or other mints, M&Ms, gummy bears are welcome desserts. Freezer Bag Cooking is a great way to prepare food and eliminate the cleanup. You have to do a few things at home before leaving, but it’s totally worth it. “Most people who do the FBC method will package their meals at home before the trip. You will want to note on each bag what the meal is and how much water is required. Some will tuck a tiny note inside, others use a permanent marker on the outside. When getting ready to “cook” your meal, bring your water to a near boil. Pour the water into your cup to measure, then add it to your freezer bag. This way you avoid the chance of burns, adding too much water, or touching your freezer bag with a burning hot piece of metal – and having the small potential of melting the bag. You DO NOT need boiling water to rehydrate meals! Boiling is at 212°, 180° water will work just fine. If you need to boil your water to remove any chance of water-borne pathogens let it cool for a couple minutes and then proceed. Stir with a long-handled metal, wooden or heat safe plastic spoon. After you have mixed it well, zip up the bag tightly and wrap in a fleece hat, jacket or cozy made for the purpose. Then let sit for 5 to 15 minutes (the recipe and altitude will determine how long), make yourself a drink and wait for your meal. Once ready, stir well and eat. We usually put our freezer bag into our cozies before we add the water (since we use a dedicated cozy), this works well as we don’t have to hold the bag upright while the water is added.”What is a COZY and where do I get one? Backpacking Food Sources. Purchase online or at a local outlet. Always know the dietary limitations of everyone in the group. 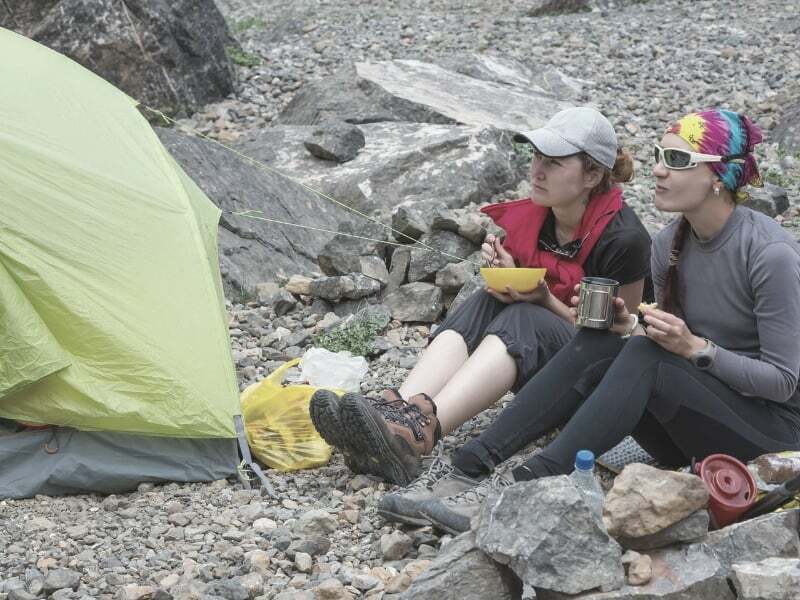 It is very possible to have a tasty vegetarian menu on a backpacking trip. Request your own free Google Docs copy. “Backpacking for Boys” contains Checklists, “Trail Tips”, pictures and useful references for a fun (and safe) wilderness backpacking adventure. Topics include trail leadership, physical conditioning, planning the hike, what to pack, how to buy equipment, taking care of your feet, navigation, wilderness first aid, setting up a campsite, and ideas for fine dining at any altitude. Most trek leaders carry emergency food if they are going out for several days. The idea is that the emergency food will be preserved for a real emergency, and is thus off limits to hungry boys looking for a snack. In reality, it’s not uncommon for the emergency meals to be consumed before the end of the hike, either because a planned meal did not turn out as expected or because Scouts decided to have some sort of feast. To keep the emergency food safe for an emergency, some units take things that Scouts will not normally eat, like cat food and green vegetables. On the other hand, some groups take too much food, which should be carried out of the wilderness if it is cooked and uneaten – a messy and unappetizing proposition. In my experience, too little food is better than way too much. So we have learned to cut our collective pack weights by skipping lunch on the first and last day of the hike, substituting energy bars instead. To compensate, we plan a big breakfast on both days.